Chomper Buddies can be sent to children to help with coping. 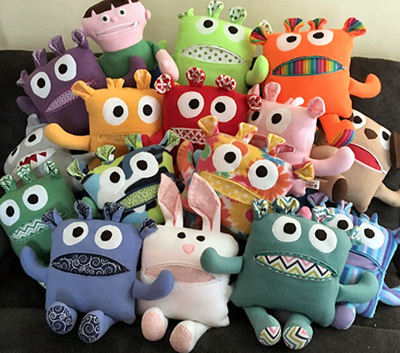 Chomper Buddies, a service that is provided to our patients and their families to help with coping, either with grief or just the changes going on in the family during Cancer treatment. A tool for parents to find out what is bothering their child. The child writes or draws their worries on a piece of paper and feeds it to the Chomper Buddy. They zip up the mouth and the Chomper Buddy chomps their worries away. The parent is then able to open a line of discussion about their child’s fears, worries, and frustrations. The Chomper Buddy becomes the child’s companion and confidant. H.O.P.E. also has a Special Design to be used for a child who had lost a loved one. and he’ll look after you. and let him chomp and chew! and the things that make you blue. you will feel as good as new! and, if you mention H.O.P.E. in your purchase $10 from your purchase will be donated to H.O.P.E.